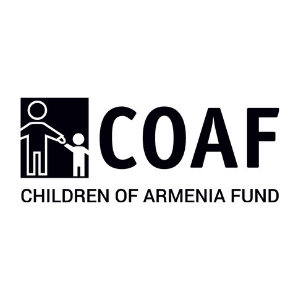 The Children of Armenia Charitable Fund (COAF) is a non-profit, non-governmental organization that employs community-led approaches aimed at improving the quality of life in rural Armenia, with a particular focus on children and youth. The organization was founded by Dr. Garo H. Armen in New York City in 2000, and the office in Yerevan, Armenia opened in 2004. COAF is funded through monetary and in-kind donations made by donors and benefactors at COAF’s annual fundraising gala evenings and other events organized in New York City and Yerevan. COAF is additionally funded through grants and co-financing opportunities by COAF’s partner organizations. With the introduction of a unique clustering approach to development, COAF’s program was launched in 2004 in Karakert, a village in the Baghramian Region of Armavir Marz. By mid-2016, COAF has been active in forty-four rural communities in Armavir, Aragatsotn, Lori, Gegharkunik, Shirak and Tavush regions, bringing the number of beneficiaries to over 67,000. Economic Development to support rural economic growth and stimulation. COAF’s major accomplishments aimed at improving the quality of life and making rural Armenia a better place for the youth include hundreds of projects in infrastructure reconstruction and rehabilitation, including rural schools, kindergartens, health clinics, community centers, playgrounds, public parks, creativity labs, drinking water systems/ channels and irrigation water networks, trainings in healthcare, education, entrepreneurship, psycho-social studies. In 2015, COAF developed and started implementing a new vision – the SMART Initiative. SMART is a model for improving self, society, and the environment. Through tailored new offerings as well as proven highly effective programs implemented by COAF over the last decade, SMART is designed to advance a generation across the rural world through education and innovation. The SMART Initiative will be implemented through SMART Centers, which will serve as epicenters for knowledge exchange to invigorate promising, yet under-supported areas of Armenia. SMART will become an exemplary model of rural development and will be replicated in other Marzes and communities throughout Armenia, reaching out to more than 800 rural communities. Another tool the SMART Initiative utilizes are SMART Rooms. Equipped with state-of-the-art technology, SMART Rooms not only connect rural communities to the SMART Center, but allow them to interact with other villages, the capital Yerevan and the rest of the world. As a pre-condition for the success and sustainability of its development programs, COAF prioritizes capacity building of local residents and networking within and between villages. Additionally, COAF always encourages the active participation of community members and program beneficiaries to create a well-balanced understanding of the villages’ priorities.